After Victorio’s attempts to obtain permission for his people to return to the Mescalero Reservation failed, he and Lozen took action. They encouraged their people to flee in different directions. Lozen took charge of a group of women and children and headed to Mexico. When they approached the Rio Grande, swollen with the season’s earlier rainfall, many of the women and children did not want to cross. Lozen took the lead. With her rifle raised above her head, she struck the shoulder of her horse with her foot and they plunged into the water, swimming upstream through the raging river. Impressed by her bravery, the group followed her to safety. Knowing they had reached safety, Lozen went back across the river to find her brother and their band of warriors. They traveled to Chihuahua, Mexico. Hoping to gather more ammunition and Apache warriors, Lozen left Victorio and his band to travel back to the Mescalero Reservation with the U.S. and Mexican cavalries on her heels. She took with her a young pregnant woman who wanted to return to her family. On the way, the young woman went into labor. Fearing capture from the Mexican or U.S. Armies, Lozen hid the woman in the brush and delivered her baby. Because of their delay, they ran out of food. Lozen, using her knife, single-handedly killed a longhorn and butchered it. When the woman could travel a few days later, Lozen, stole two horses and other supplies they needed to return to Tularosa. Once they’d arrived, Lozen learned that Mexican forces had ambushed her brother. It is believed among the Apaches that instead of being taken hostage and killed at his enemies’ hands, Victorio committed suicide. After Victorio’s death, Lozen returned to the San Carlos Reservation with chief Nana, only to leave again in 1882 where they joined forces with Geronimo. Together they raided the San Carlos Reservation and freed over 600 people. Lozen and Geronimo again raided San Carlos in early 1885–the last campaign of the Apache wars. Later in 1885, Geronimo negotiated an Apache surrender with the U.S. Government. Unable to come to terms, the Apaches spent several more months running from U.S. and Mexican forces until they ran out of ammunition and supplies. Geronimo surrendered and he, Lozen, and approximately 40 others, including another renown Chiricahua woman warrior, Dahaste, became prisoners of war and were hauled off to a concentration camp in Florida. In 1887, Lozen was later transferred to Alabama where she died of tuberculosis at 50 years of age. Horsewoman. Medicine Woman. Mystic. Military Strategist. Warrior. Empowered Woman. These are just a few of the words used to describe one of the most impressive women in Southwest history and American History. Born in 1840 Lozen, a Chihenne Chiricahua Apache, grew up in the Warm Springs area, or Ojo Caliente, New Mexico. 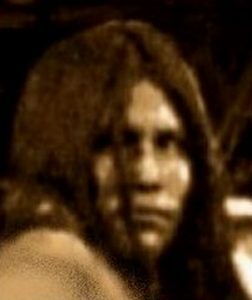 Sister to the Apache chief Victorio, Lozen (although 15 years his junior) became his “right hand” and his most trusted advisor. For decades she counseled her brother and other Apache chiefs, including Nana and Geronimo, in matters of war, religion, and the livelihood of their people. Lozen (an Apache nickname meaning expert horse thief—her birth name isn’t known ) grew up during one of the bloodiest eras of American History. Strife between her native people, the Mexican people, and the U.S. Government remained constant in her life, and although she and her people always strove to keep their lands and live in peace, they never achieved either. It became obvious early in Lozen’s childhood that she had special gifts and talents including supernatural powers. Though she might have earned her nickname as a young woman, as a child, Lozen felt a great connection with horses and was an expert at taming, training, and riding them. She had no interest in marriage nor the domestic duties of the other girls and women of her tribe. With her superior athletic skill and prowess, Lozen preferred learning about martial arts and the ways of battle, which her brother was eager to teach her. In addition, she showed an aptitude for healing and medicine and often cared for the sick and injured of the tribe. She also became an expert midwife. Victorio and Lozen fought many battles with the neighboring Mexicans, the U.S. Government, and the white settlers who had come to their lands. In 1869, Apache leaders, including Victorio and Lozen, met with the U.S. Government to secure peace and receive a promised land grant, or reservation, near Ojo Caliente. However, in time, the Chihenne were moved to the Mescalero Reservation near Tularosa and were later relocated to the San Carlos Reservation in Arizona. The conditions at San Carlos, referred to as “Hell’s Forty Acres,” were harsh, and many Apache’s perished due to inadequate food, water, and healthcare. 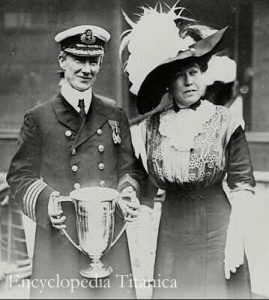 Margaret Tobin Brown, a woman immortalized in numerous movies, documentaries, and the Broadway musical “The Unsinkable Molly Brown,” never considered herself anything more than a good citizen. Made famous by her heroic efforts during the sinking of the RMS Titanic, Mrs. Brown used her fame and fortune to better the world. But, even as a young woman, Margaret Brown did what she could to serve humanity. Here are some less known facts about one of America’s most memorable heroines. Born in 1867, Margaret Brown, known as “Maggie,” by friends and family, came into this world in 1867 to Irish Catholic immigrants John Tobin and Johanna Tobin. 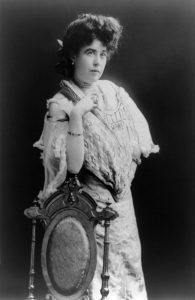 She became known as “Molly” with the success of the 1960 Broadway musical, “The Unsinkable Molly Brown,” decades after her death. Maggie spent her early years in a small cottage on Denkler Ally in Hannibal, Missouri. She never attended school but took lessons with her siblings in the home of her mother’s sister, Mary O’Leary. At 13, Maggie helped support her family by working at a tobacco factory for sometimes 12 hours a day, 6 days a week. At 19, she set out with her sister to Leadville, Colorado to visit their older brother Daniel, who had settled there. Maggie decided to stay and kept house for her brother. She also worked as a waitress and as a sales clerk in a dry-goods store. In church one Sunday, Maggie laid eyes on the tall and handsome mining engineer, James Joseph (also known as J.J.) Brown, and fell in love. At 19 years of age, she married the Irishman who was more than 10 years her senior, and the two set up house in a two-room cabin outside of Leadville. Both Maggie and J.J. worked hard during their young married life. Intelligent and innovative, J.J. Brown rose to manager, then superintendent for the Ibex Mining company and made a decent living. His innovation proved instrumental in developing a technique which allowed for mines to be built deeper into the earth. One such mine, Little Jonny, hit gold in 1893, producing tons of gold ore, and making the Browns and many others at the Ibex Mining company, instant millionaires. Even before she lived a life of immense wealth, Maggie always did what she could to help others. As a young wife and mother, she organized soup kitchens and helped other mining families less fortunate than hers. She became involved in politics and spent her efforts in that arena working for better schools and health care for mining families. After her good fortune, she joined many political and charitable organizations and even made a run for Congress— though she had to drop out of the race. Women in Colorado did not even have the right to vote yet, and her chances of winning seemed impossible. Regardless, Maggie continued to work for causes concerning children, public health, food production, education and libraries, women’s suffrage, and animal rights. She also worked to help establish a juvenile court system in Denver so that children and teens who committed crimes did not have to serve time in the adult population. She helped to establish the Denver Women’s Club, an organization devoted to providing art education in schools, and the development of school libraries. Having lived a lifetime of helping others, Maggie continued to do so even when her own life was at stake with the sinking of the Titanic. Once aboard Life Boat Six, Maggie, having put on several layers of clothing to shield herself from the frigid temperatures, shared her coat and more with those who had to escape with little to wear. Once they were safely aboard the Carpathia, the ship sent out to retrieve survivors, Maggie worked tirelessly to help her fellow passengers. She paid for telegrams to be sent to survivors’ friends and family, and she organized a ‘survivors fund’ for medical expenses and temporary lodging for those in need. She raised $10,000 before they reached the shores of New York. Now famous for her magnanimous spirit and courage, Maggie continued to help with causes close to her heart. In 1913 coal miners in Ludlow, CO went on strike, resulting in a deadly skirmish between the National Guard and the miners. Nineteen people, including eleven children were killed in what became known as the Ludlow Massacre. Maggie sent first aid supplies, food, and clothing to the surviving miners. She sent funds to help settle the strike and investigate the massacre. During the first world war, Maggie traveled to France with an American relief committee. There, she also worked with the Red Cross. When she returned to New York, Maggie devoted time and resources to help soldiers who’d been injured in the war. Her efforts resulted in France bestowing her with their most esteemed award, the French Legion of Honor. As a young mother, Maggie saw to the education of her children, and herself. After completing her daily chores, she studied literature, piano, and took voice lessons. Later, she hired tutors to help her improve her grammar and writing skills. She traveled to New York to study literature, drama and foreign languages at the Carnegie Institute. She became proficient in five different languages which proved instrumental in helping the International survivors of the Titanic. More of Maggie’s interests included acting, yodeling, classical guitar and the Ukelele. 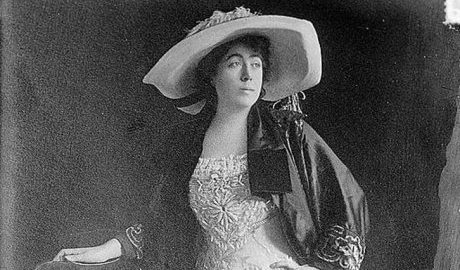 After the Titanic disaster, stories filled newspapers at home and abroad about the heroic efforts of Margaret Brown, but she did not want to be known as a heroine. “I did only the natural thing and not the heroic.” And that is how this amazing, strong and empowered woman, who set an example for everyone, lived her entire life. Some people find empowerment through their passion. Other people find empowerment through what they do for mankind. Still others find empowerment through their search of self and belonging. Such is the case for Mabel Dodge Luhan, self-proclaimed Muse of the Arts. As an only child, Mabel Dodge Luhan grew up with wealth and privilege; two things many people strive their whole lives to achieve. But what she never had, until later in her adulthood, were things that many people take for granted; love, attention, and feeling of belonging. Sara, Mabel’s mother, often the victim of Charles’ temper, grew indifferent to him and had little interest in her only child. While Sara entertained herself with the society of New York, Mabel spent most of her time in the care of a nanny, and then later school mistresses at Saint Margaret’s Episcopal School for Girls, and Miss Graham’s School in New York City. At 16, Mabel toured Europe and then attended the affluent Chevy Chase Finishing School in the Washington, D.C./Maryland area. Educated in the arts of an upper crust domestic wife, Mabel, at 21 years old, married Karl Evans, another silver spoon youth. Her father did not approve of the match, and her mother remained indifferent. The young couple soon had a child, a boy they named John. Perhaps because of her own upbringing, Mabel struggled with the confines of marriage and child rearing. After only two years of matrimony, Karl died in a hunting accident, adding to Mabel’s emotion duress. A single mother, now facing life alone, Mabel suffered a nervous breakdown. When she recovered, she took her young son and moved to Europe. In Paris, she met Edwin Dodge, an architect from Boston. 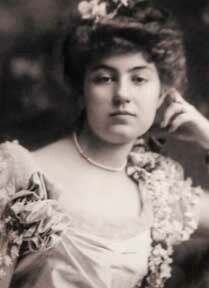 He pressed his suit, and eager for a father for John, and security for herself, Mabel agreed to marry Dodge in 1904. For eight years, often dressed in Renaissance costume, Mabel entertained the famous and noteworthy of International society, including novelists, artists, photographers and art critics. Her Italian “salon” became a place of philosophical, political, and artistic enlightenment. Still discontented with married life, Mabel left Dodge and moved back to New York where she established another salon for the artistic intelligentsia. From 1913 to 1916, she entertained those interested in unconventional attitudes of the era. Freudism, free-love, anarchy, and modern art were popular avant-guard topics discussed at Mabel’s house. Inspired by the conversation, Mabel embarked on a writing career and wrote for literary and art magazines, including Alfred Stieglitz’s publication, Camera Work. Stieglitz and his mistress at the time, Georgia O’Keeffe, frequented Mabel’s home along with mutual friends Leo and Gertrude Stein. 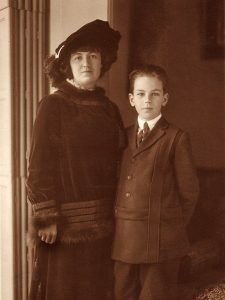 Between 1914 and 1916, she met and married artist Maurice Stern. Even though Mabel had created a world of her own, she still could not find happiness. In 1917 she and Stern traveled to New Mexico, a provincial and wild place she’d learned about from her friends the Steins. She arrived in Santa Fe, and was entertained by other wealthy, female east-coast transplants like Alice Corbin and Natalie Curtis Burlin, who had already established themselves in the town. Mabel moved to the nearby village of Taos to start her own literary society. There she met and befriended Tony Luhan, a Pueblo Indian. 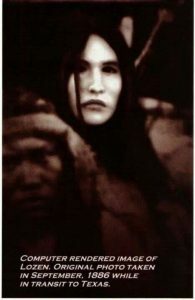 Mabel asserts that before arriving in Taos, she had a dream where she saw her husband Maurice’s face turn into that of an Indian. Mabel believed Tony to be that man. Tony encouraged Mabel to buy property, a 12-acre parcel of land, complete with a tiny dwelling. Tony helped the Stern’s remodel and rebuild the four-room adobe house. He set up a teepee on the Stern’s front lawn, and proceeded to woo Mabel. It worked. She sent Maurice packing and married Luhan in 1923. The colorful landscape and rich culture of Taos gave Mabel the life and love she craved. Finally, happy and at peace, Mabel, with her fourth and final husband, Tony Luhan, entertained some of the most famous literary and artistic minds of their time, including Ansel Adams, Willa Cather, Aldous Huxley, and D.H. Lawrence. 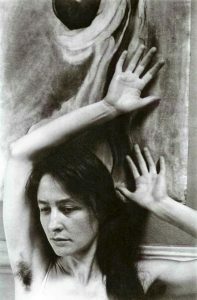 Georgia O’Keeffe, while visiting Mabel, decided that she, too, could find infinite inspiration from the enchanted landscape of New Mexico, and also settled there. The Luhans eventually expanded their home to 17 rooms, and continued to provide literary and artistic inspiration for others, as well as forging Mabel’s own talents as a writer. Never known for her warmth or sunny personality, Mabel, regardless, indeed made her mark on New Mexico and American history. She promoted Native American culture and art, as well as other important artists, writers, and abstract thinkers of her time. She found empowerment through her continual quest to get her life just right, and become the person she aspired to be. Her vision, her promotion of others and herself, helped make Mabel Dodge Luhan an institution in Southwestern history. Georgia O’Keeffe—a name synonymous with the beauty and mystique of the Southwest. Born in 1887 to dairy farmers in Wisconsin, Georgia showed a passion for art at a young age. Her parents supported her interest by enrolling her in art lessons with a local watercolorist. At 18 years old, Georgia studied at the Art Institute of Chicago. After a bout of illness, she returned to school at the Art Students League in New York City. There, she produced a still-life painting entitled Dead Rabbit with Copper Pot, and with the painting, won a scholarship to attend the League’s satellite school in Lake George, New York. In 1908, her art and her passion took a turn. Unable to finance her studies due to her family’s bankruptcy, Georgia took a 4-year hiatus from her craft. She began teaching in 1911. In 1912 she took an art class that focused on the work of Arthur Wesley Dow, and started to experiment with abstract principals. This would prove pivotal in her future career. In 1915, while teaching at Columbia College, she created a series of charcoal drawings. The drawings, depicting shapes she found in nature fused with her own subconscious feelings, showed O’Keefe’s unique perspective of integrating art with emotion. That same year, Alfred Stieglitz, a photographer and owner of 291, an esteemed art gallery in New York, received O’Keeffe’s charcoal drawings from one of her colleagues at Columbia College. Stieglitz exhibited 10 of the drawings at his gallery in 1916 without the artist’s permission. When O’Keeffe heard this, she wrote to him and asked that he take them down. Stieglitz refused, insisting that her art and her unique vision needed to been seen and shared with the world. Unable to forget the work (and the woman) that moved him in such a profound way, Stieglitz arranged for O’Keeffe to come to New York to paint. A professional, and then later, a personal relationship developed. Already married to Emmeline Obermeyer, Stieglitz fell hard for O’Keefe, 23-years his junior—the muse he’d always longed for. While his wife was away, Stieglitz started photographing O’Keeffe at his family’s New York apartment. Emmeline feared an affair between the two, and demanded Stieglitz terminate his relationship with O’Keeffe. In turn, Stieglitz secured an apartment and he and O’Keefe moved in together. It took 7 years for Stieglitz to obtain a divorce, but finally, he and O’Keefe married in 1924. 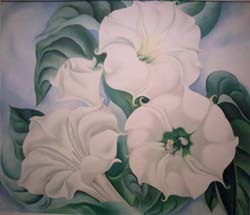 In New York, Georgia became influenced by the movement of Precisionism and began to create the floral paintings that catapulted her to fame. During her lifetime, O’Keeffe made over 200 large scale depictions of flowers such as Oriental Poppies and later, her famed Jimson Weed that sold in 2014 for over $44,000. In 1925, O’Keeffe buried herself in this new found precisionist style and began painting a series depicting the New York skyline and the skyscrapers that formed the urban city’s landscape. Due for a respite from the bustling city, in 1926, O’Keeffe traveled to New Mexico with a friend. They stayed with Mabel Dodge Luhan, another east-coast transplant, at her home in Taos. There, O’Keeffe became enchanted with the colors and landscapes of the New Mexico desert. 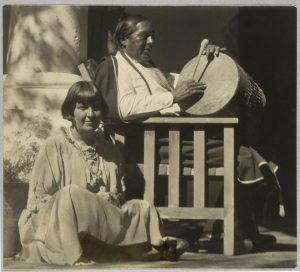 By 1929, she would spend part of every year in Taos and Abiquiú, much to Stieglitz’s disappointment. The relationship between Stieglitz and O’Keeffe was both passionate and tumultuous. 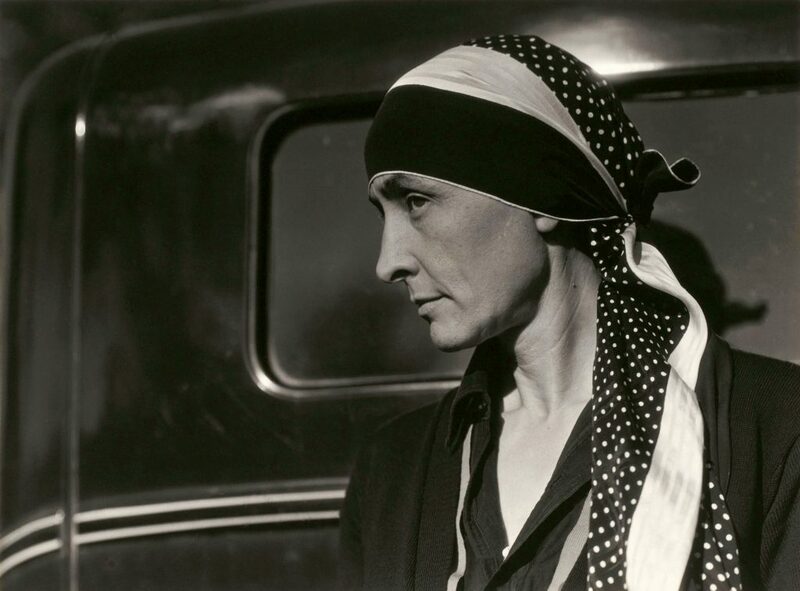 O’Keeffe wanted to spend more time in New Mexico while her husband needed to stay in New York to manage his galleries. Another affair occurred. This time between Stieglitz and a young protégé, the photographer Dorothy Norman. 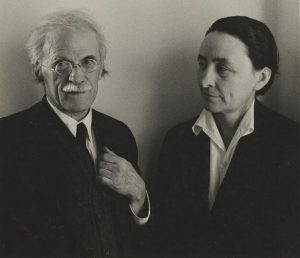 In 1946, at the age of 82, Alfred Stieglitz died with O’Keeffe by his side. Three years after that, O’Keeffe made New Mexico her permanent home. In 1949, she was elected to the National Institute of Arts and letters, and began traveling the world, seeking further inspiration. She continued to expand her abstractionist style. Inspired by her sky side view in airplanes, she created a cloudscape series, including Sky Above Clouds IV. In the early 1970’s, O’Keefe began to lose her eyesight from macular degeneration, but her passion for her art and her artistic vision never wavered. She continued to produce art with the help of assistants, and also wrote her autobiography, Georgia O’Keeffe, which became a best-seller. O’Keeffe received many awards throughout her lifetime for her dedication and contribution to the world of abstract art. In 1977 she received the Medal of Freedom from President Gerald Ford, and the National Medal of Arts in 1985. In the Spring of 1986, O’Keeffe died at her home in Santa Fe, New Mexico. Eleven years later, the Georgia O’Keeffe Museum in Santa Fe was built in her honor. There, her memory lives on with 140 oil paintings, nearly 700 drawings and hundreds of additional works dating from 1901 to 1984. Although O’Keeffe and her work broke ground for female artists around the world, she never identified herself as a “woman artist” or as a feminist. She wanted to be known only as “an artist”, an individual drawn to her craft by something within her that could not be held back or held down. She lived her life just as she wanted, with a unique passion, vision and boldness. Her work, like the woman herself, is empowered, unmistakable, and utterly unforgettable. To learn more about the Georgia O’Keeffe Museum, click here.